The accessibility of high quality online photography education has been a game changer for photographers who want to be able to improve their skills without paying for photography school or expensive in-person workshops. Companies like CreativeLive have a TON of online photography classes on a large range of subjects, and can range from complete beginner to the most advanced. It can be a bit daunting and overwhelming when you look at their extensive catalog, to determine which one is the best, or is right for you. They are all a bit different, and every one of their pro instructors have different styles and energy. It can be difficult to decide which online photography course is the best for beginners and your unique style. Well I have some good news: I have taken the time, watched all these courses, and done the hard work for you. These are my reviews of the exact best online photography courses that will teach you everything you need to become a photographer. If you are truly new to the world of photography, this is the best place to start. The instructor of the Fundamentals of Photography course, John Greengo, is a master at communicating the somewhat technical elements of photography, in an easy-to-follow, digestible way. You will learn how it all works: like what shutter speed, aperture, and ISO are, and how they affect your pictures. This beginner's photography course is fairly all encompassing. It does go into the details of how to take a good photo, but it doesn't dive into the realm of post-processing, special techniques, understanding light, etc. To get all of that, the Photography Beginner's Bundle gets you all the courses to get you started, at a discounted price. This class is managable, affordable, and covers the basics really well. You will find yourself referencing the material again and again. Watch the free preview here, and see if his teaching style is right for you. Now that you have a basic understanding of photography in general, it's time to accept the hard truth: if you don't have a solid grasp of your specific camera model's buttons, menus, and features, then you won't be able to take better photos. You will be stuck encountering the same frustrations over and over. Issues like out of focus images, blurry subjects, over-exposed sky, etc. Every camera is different, and they all come with lots of nobs, dials, and buttons - most of which are confusing. But when you know how to get the most out of your camera, photographic opportunities open up in front of you. Most of this information is in the camera's manual, but let's be real here, no one reads those. This is why CreativeLive has developed a large catalog of short, digestible video courses that are specific to your camera model. 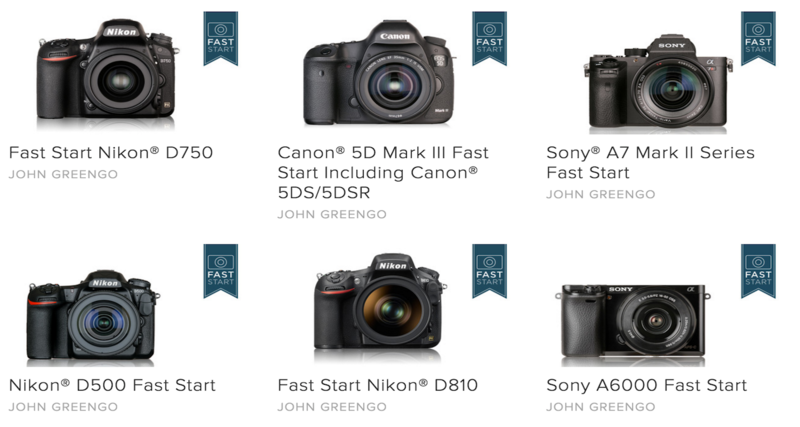 They call them "Camera Fast Starts," and they are all taught in a very straightforward, comprehendible way. When I bought my Nikon D810, the first thing I did was watch the CreativeLive Nikon D810 Fast Start course. I was then immediately able to go out and start taking photos the way I wanted, with the settings I need. Chances are, they have your specific camera model too. Every modern camera is a highly-capable piece of technological amazement, and I highly recommend learning every detail about it. First learn the fundamentals of photography, and then learn how your camera works. Not a Beginner? Ready to Improve? CreativeLive has a lot of really great landscape and outdoor photography classes, too many to really talk about. The first one, is ideal for someone who is a little more beginner, just starting out in landscape photography and wants to improve. All of these classes though are ideal for someone who is a little further along, and wants to find ways to really set themselves apart, develop their unique style, and refine their landscape skills. I highly recommend all of them. What could be cooler than a start to finish landscape photography course that is geared for beginners? A landscape photography course that I am actually in! I was able to accompany professional landscape photographer, Matt Kloskowski while we filmed this awesome course. I asked him questions, and we discussed camera settings and composition while on location. That's even me in the promo video to the right. If you are new to landscape photography and are interested in learning how to do it well, this is the course. Matt's teaching style is so approachable and easy to understand, and he really does a great job at covering all the best pro tips to be able to make a landscape photo that truly stands out. You should note that this course doesn't cover as much of the technical information that some people prefer. However, you should already know the fundamentals of photography, and know how to use your camera before you take this class. Even though it's geared towards the beginner, there is still so much great info in here, even for an experienced landscape photographer like myself. This incredibly cool course with one of my favorite photographers of all time, is too good to miss. It's full of inspiration, valuable tips, and advice for making it as a pro. This thorough and in-depth course gave me so much to think about, that I'm still re-watching these videos to this day. Marc explains creative composition, framing, and lighting techniques for landscapes that have changed the way I shoot. This is an online landscape photography course for people who want to truly learn from a pro how to think about and perfect all the components of this specific skill. It's a game changer. Your photography website should be making money for you. This 2017 SEO checklist is the best way get started making that happen. These next three landscape photography courses are a bit more specialized, but are incredibly cool for exploring specific subjects in more depth. This expertly taught specialized course is really great for once you figure out how cool long exposure photography can be. However there are so many nuances, settings, and considerations that can affect the final photo - and in this class you will learn how to put them all together. This simple yet powerful course is incredibly helpful. It walks you through every possible lighting scenario that you may encounter while shooting outdoors, and teaches you how to adjust your settings to get the best possible shot. This course is another one that focuses on a specific type of photography that I personally love to shoot: long exposure photography. Matt does a great job at showing you how to master this more complicated art form. I'm a big fan of night photography, and it was a thrill to work with CreativeLive to create Night Photography Week, a 5 day long event of amazing on-location courses. I helped make the promo video on the right. You can read my full review of Night Photography Week, I highly recommend checking it out. This portrait photography course will teach you techniques for choosing the light, process and locations for a successful portrait. How to develop a rapport with your subject, and how to light on the fly. This incredibly successful course is based on the theory that Sue Bryce will take 28 days and turn you into a successful portrait photographer. This course is the entire package, and perfect for someone just starting who wants to establish a business. Veteran portrait photographer Chris Orwig is just so damn cool. In his class, you learn how to take meaningful portraits and use them to make your transition from amateur to professional. Chris is an inspiring instructor, and will show you how to connect with, light, and pose your subjects naturally. There are really so many different types of online photography courses at CreativeLive, that you can definitely find your speciality and grow what ever skills you want. The marketing and business, drone, and commercial courses are all pretty great. These however, are the ones that stand out to me as being the most fun and creative. Hmm... What does it say about me that 2/3 of these are food photography classes? In this incredibly cool course, Steve will walk you through the basics of becoming a food photographer by drawing on his own experience as a chef, certified food stylist, and photographer. He will then share the secrets to breaking into the industry. In this really fun course, you will learn about the technical techniques for capturing food in motion. It's a bit more advanced, and you’ll learn how to sell your images to editors, websites and magazines. By bringing more advanced techniques into your food photography practice, you can make your photos stand out in the crowd. This on-location class is taught by Corey Rich, one of the world's leading outdoor adventure and action sports photographers. This is your opportunity to follow a pro action photographer as he prepares for a shoot on location, and learn how he evokes powerful brand stories like those he has made for Red Bull. If you want to make money with your photographer, you have to have a good website, and getting that website to gain traffic, exposure, clients, and sales can be a major struggle. This is where Search Engine Optimization (SEO) comes in. I am your instructor in this one-of a kind class class, and I take you through every single thing you need to know about Search Engine Optimization, how it applies to photographers, and how you can use it to make thousands of dollars per month with your photography website. SEO is what allowed me to leave my job and become a professional photographer. Because my website generates consistent passive income, I am able to focus on doing more of what I love, photography. In this in-depth and comprehensive SEO class, I'll show you how you can do it too. Get started for free and start seeing results. Don't have Adobe Lightroom CC yet? Click here to get a great deal. In this incredibly helpful course, expert instructor Ben Willmore takes you through every single component of processing an image in Lightroom. You can start as a total beginner, or maybe you know the basics, but I bet you don't know everything about what this awesome software can do. This Photoshop bootcamp is exactly what it says it is, a total and complete guide to learning how to use Photoshop. Ben Willmore is great at teaching how to use this software, and that's coming from someone who really doesn't like Photoshop all that much. This is easily one of the top online Photoshop classes out there. By the end, you will know this program inside and out. This post-processing class was the first class I ever watched at CreativeLive. Unlike the above bootcamps which show you the entire functionality of those programs, this course shows you just the most critical tools specific to editing your landscape photos. Extremely helpful if this is what you are shooting. I get it, photography is something that I would probably prefer to learn in person. I spent years learning very little, and teaching myself everything as I went, mostly through trial and error. I did this mostly because I didn't know where to look, and any in-person workshop was more than I was willing to spend. These online courses though are dope. Where else can you get access to this level of instruction, by this caliber of professionals? And be able to go back and re-watch specific segments at any time? The above online photography courses take the guesswork out of learning how to improve your skills. And I know it sounds like I'm trying really hard to convince you, but that's only because I know first-hand how awesome these courses are. Have a different favorite photography course or learning resource? Let me know in the comments below, and share it on your preferred social account! Success! Now check your inbox to confirm your email address and get your free download. FTC Disclosure: I am fortunate enough to work with CreativeLive, which is how I know all about these courses. I may receive some compensation for these reviews, but what is written is an honest evaluation of my opinions of these online photography courses. There are plenty of CreativeLive courses that are not as good, and I did not include them here.